The key to aging with grace and vitality is a flexible, healthy spine. Your nervous system operates your entire body. The spinal cord carries impulses from your brain to your heart, lungs, kidneys, muscles, etc to make them function. Wouldn't it make sense to take good care of the house (spine) that your nervous system lives in so your body functions at it's highest level? Many people take better preventative care of their teeth than they do of their spine. Teeth are cosmetic and serve primarily to chew food. Your spine has a much larger, critical role in your total health and well-being. 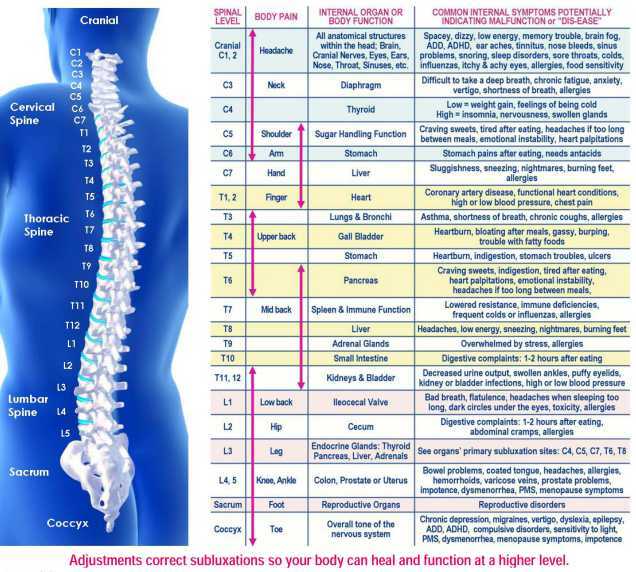 The spine houses and protects your lifeline, the spinal cord. Your spine, like your teeth, are in a constant state of aging/degeneration, and like your teeth the spinal joints need regular maintenance care to stay freely mobile, flexible and healthy. Regular adjustments slow the degenerative/aging process of the spine and allow your nervous system and body to function at their highest levels. Like teeth that are not brushed and cleaned regularly, the spine, if not mechanically stimulated and regularly mobilized, will become inflamed and degenerate at an advanced rate. Inflammation and advanced degeneration of the spine causes undo stress on your nervous system and inhibits the function of the organs and muscles that the nervous system operate. Perhaps if people's spines were on display as their teeth are, people would take better care of them. Do you have a beautiful, healthy back-smile, or a degenerative, rotten back-smile? I hope this gives you some insight to the importance of chiropractic as preventative care for total body health and well-being in addition to being a go-to for reactive care and rehabilitation. You can treat and avoid issues in your back and neck and insure that your whole body is functioning at it's optimum level with regular monthly adjustments.